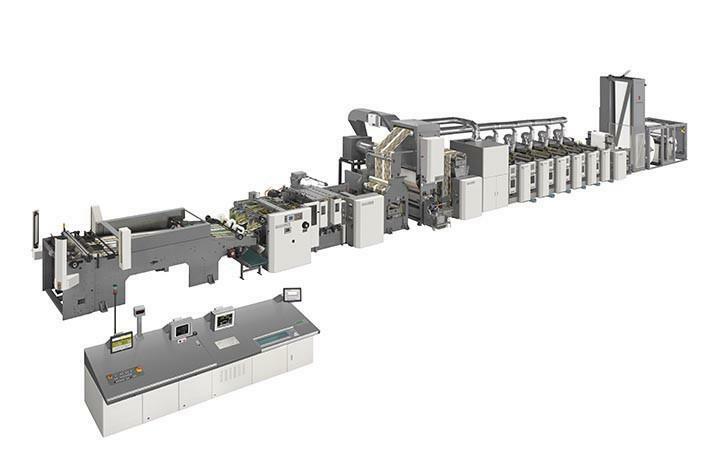 A package printing/finishing machine produced by Komori Chambon in France. This press is equipped with in-line processing functions such as printing, coating, and die cutting functions. The ORS-650 has also been automated and made more energy efficient, while packaging-specific technology and know-how have been added. There is also a lineup of products that are suitable for many different printed items and short runs and can meet the diverse needs of package production such as offset printing, gravure printing and flexo printing/coating. The ORS series cassette (cylinder unit) type webfed offset printing presses are cutting-edge machines that incorporate the latest technology such as independent unit drive, remote control automatic plate register adjustment, automatic ink roller cleaning, zero-setting function, and PQC (Print Quality Controller). In addition, the OS series plate/blanket cylinder sleeve press (maximum printing speed 350m/minute) is available.